I will always love the classic look of jeans paired with a simple white top and a great pair of heels. It's an effortless combination that's easy to achieve no matter what your budget is. Instead of going with my usual pair of black heels, I opted for my lady like red pair (I just adore the bow detail) that added just the right amount of color to my classic look. I hope everyone had a great weekend! Love this combination Audrey! Those red heels are fabulous! Hope you had a fabulous weekend! This is just beautiful - navy & burgundy is one of my favorite color combinations this fall and you pulled it off so well! Beautiful! Love this look and the pop of red! You look stunning! Loving your cute lil bump tucked away and those adorable shoes! Look at you....looking all so glowy in that classic look & baby bump! Love your redesign too!!! That black military inspired coat is fab! Love, love the gold buttons! I so need the perfect red pair of pumps as they totally make an outfit! You look great! I'm thinking someone needs to hire you as a maternity model! Those shoes are fantastic! And you look stunning in the basic white tee and jeans. Way to go! you are too cute! i LOVE that coat and those heels are ADORABLE!!! Cute coat! Can't believe it's F21. You look great and very chic! That coat is gorgeous! Looks so much more luxe than F21! Great find! And of course, I'm weak for the gold buttons! 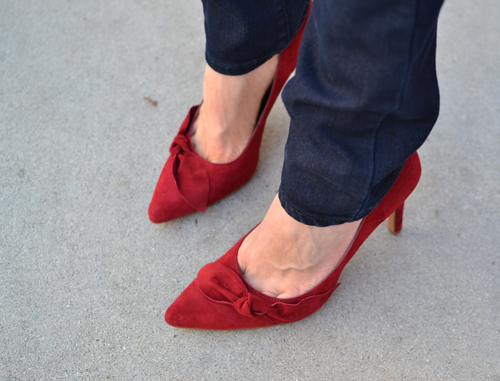 And those red pumps are just perfect with this whole look - perfect splash of color, and totally classic! Love the shoes Audrey! They are so beautiful, I think they really dress up the entire look. I love that shade of red. Those shoes are amazing and so perfect for this outfit! You're right nothing is more simple and more classic than a white tee and jeans! ANd that coat is gorgeous! What a great Forever 21 find. Great look, Audrey! The heels are the perfect pop of color! :) Love the coat too! P.S. Wish I could still fit in my Paige skinny maternity jeans -- nope, I can only fit in the black skinnies (because they are mad stretchy), and the boyfriend styles! Not a whole lot fits these days lol! You look fabulous! I adore simplicity and love this look. Great heels! I especially love the red shoes. Perfect look! Love the coat & the heels so much!! You look lovely! What a classic outfit!